After making two giant pots of chicken soup, I had lots of soup vegetables, left over. Rather than throw them out, I put them in the refrigerator, hoping I would think of something to do with them. My husband is the hero and suggested patties and offered to get the muffin tins, for me. Silly me asked him which he wanted, vegetable pancakes or muffins and he started to say the pancakes until I frowned and said, “They’re fried.” Muffins of a sort is what we got and they were definitely baked. I am going to do my best to re-create this recipe . It was one of those that I put ingredients in, as I thought of them. About 3 cups of assorted soup vegetables – carrots, onions, sweet potato, turnip, celery and parsnip. 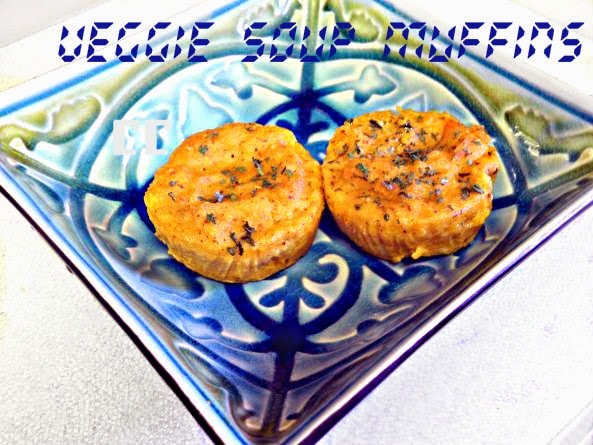 Take cooked soup vegetable and put them through the food processor until you have a smooth blend. There will be liquid from the soup even though you should drain it, first. After removing it from food processor, drain again and put in a large bowl. Add potato starch, nuts and eggs and mix well. 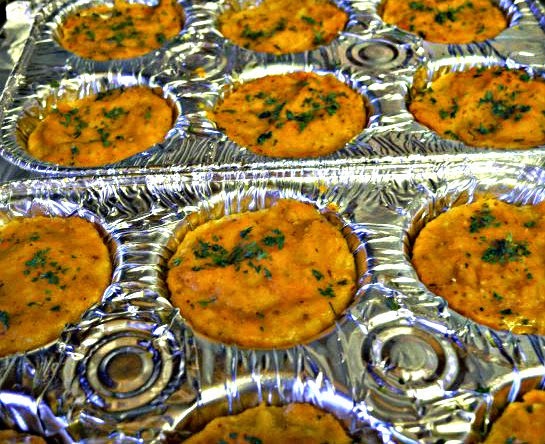 Spray muffin tins with olive oil and pour muffin batter into cups. Bake at 350 degrees for about 25 minutes. Believe it or not, you end up with a little wet but delicious “muffins”. You can add anything you want to the recipe. Great use of those soup veggies, Chaya. The muffins have turned out awesome! What a great way to use up leftovers, Chaya! Pinned to my 'Love Your Leftovers' Board on Pinterest. Thank you for sharing it with us at the Hearth and Soul hop.